Patrick Anderson’s Autobiography of a Disease offers a poetic and indispensible contribution to the growing body of literature that traces illness from an autethnographic perspective. It will reward a broad spectrum of lay, academic, and medical professional readers with its detailed account of the broad web of relationships impacted by one person’s illness. 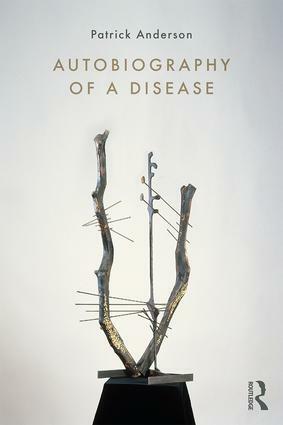 Anderson depicts each of these relationships with exemplary ethical care—including his relationship with the virus itself, personified in a captivating and moving way that reveals the flaws in our health care system and the dedicated people who struggle within and against that system as they fight for their lives and the lives of others. I’ve been waiting for this book for a long time, anticipating Patrick Anderson’s always acute, insightful, nuanced, approach to understanding the performances and representations of our lives. Autobiography of a Disease exceeds all my expectations, as it experiments with form, multiplies narrative voices, and undoes the primacy of disciplinary approaches to knowledge and experience. Anderson deploys any and all strategies to evoke the uncanny journey to the precipice of mortality and back to another kind of life. A moving, stunning, necessary book. This is a captivating intervention into medical and illness narratives. It realizes the power of disease and care with equal parts precision and pleasure. A must-read for anyone interested in how we live in, with, and by our bodies. Patrick Anderson’s Autobiography of a Disease offers a rare and much-needed view of illness that binds the political economy of American medicine to the personal and interpersonal work of healing. With precision and poignancy Anderson offers a harrowing narrative of disease as a communal event linking human and nonhuman agents, moments of peril, and moments of grace. It is an unflinching, creative, and utterly compelling account. Everyone who has been -- or will be -- a patient or a caregiver should read this book. Patrick Anderson is Associate Professor in the departments of Communication, Ethnic Studies, and Critical Gender Studies at the University of California, San Diego. He is the author of So Much Wasted and the co-editor (with Jisha Menon) of Violence Performed.